This is an easy recipe that can be eaten for breakfast or for dessert! Be sure to soak the rice overnight, or else it will not cook properly. Soak the rice in cold water overnight, or in warm water for 5 hours. Place the black rice and water in a medium sized saucepan and bring to a boil, uncovered for approximately 30 minutes, or until water is 90% evaporated, stirring often. Lower the heat to medium, and stir in sugar, salt, coconut milk and vanilla. Stir until sugar and salt is fully dissolved and remove from heat. In a small saucepan, heat all the ingredients “for the coconut cream” over medium heat, whisking until mixture becomes thick but still pourable. 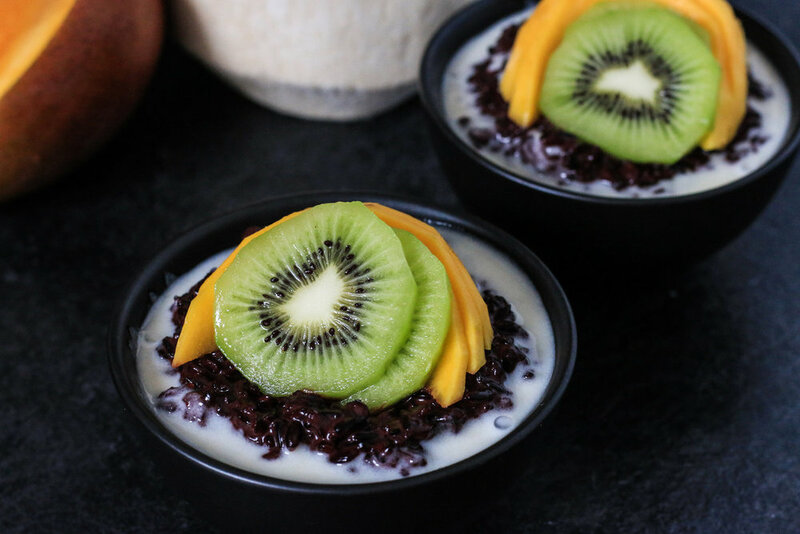 To serve, spoon black sticky rice into a bowl, pour desired amount of coconut cream over top and top with fresh kiwi, mango and coconut flakes.